Nelson Mandela shakes hand with former apartheid president F.W. de Klerk, with whom he shared the Nobel Peace Prize. Almost no one in the late 1980s believed apartheid would end peacefully. The government was in trouble but the core of its system that kept the whites in power looked solid. It was under attack on the streets of townships – but children with stones and burning tyres, though persistent, were no match for a brutal well-armed police force. And the government was becoming more and more aggressive in killing or imprisoning opponents at home and attacking its enemies abroad. As the country looked increasingly like an archipelago of white-ruled bastions amid a turbulent black population, the rhetoric was becoming more and more paranoid. However, the main opposition organization, the African National Congress, was suppressed in South Africa, ineffective except as an inspiration. Based in Lusaka, Zambia, it poured out aggressive Soviet-styled propaganda about revolution but could do little else. However, the ground was shifting beneath the feet of both the apartheid government and the ANC. In 1988 I was summoned by one of its senior members and told that there were rumours that Nelson Mandela was talking to the government. There had been an unsubstantiated report that he had held a discussion with some of its senior members. The official hinted that the ANC leadership in exile was no longer sure that Mandela was keeping to the ANC line. The implication was that Mandela was no longer a reliable representative. The rumour turned out to be true. Mandela had broken the fundamental rule of the ANC: never to have contact with the enemy. He had done it entirely on his own initiative, disclosing it to no one. In 1987 he met Kobie Coetzee, the Justice Minister, and two years later, President P.W. Botha. He offered talks about talks but said that only the ANC itself could authorise negotiations. It was as if he, completely removed from the political scene for more than 20 years, cut off from his followers who dared not even speak his name, had seen a spark of light in a very dark tunnel. In secretly agreeing to that meeting Mandela gambled everything. Already a prisoner for 24 years, he had second or third hand information about events in South Africa and even less information about the intentions of the South African government or the US and Europe. He knew that the Central Committee of the ANC would have forbidden it if they knew and would have expelled him if he went ahead. It was an extraordinary gamble. That vision and courage displayed here made him a great leader. The meeting began with an almost Biblical moment. On February 12th 1989, as Mandela waited outside President Botha’s office dressed in a new suit and shoes, the prison governor noticed Mandela’s shoelaces were undone. After so many years of prison rules where laces were forbidden, Mandela had forgotten how to tie them. The governor knelt before Mandela and tied his laces. From that moment the initiative lay with Mandela. His lone decision to meet the government and President Botha was one of three fundamental choices he made that changed South Africa’s history. The first was made in 1941 when Mandela, aged 22, decided to leave home. He grew up in rural Transkei where his aristocratic family had ruled for generations. Later he often portrayed himself as a simple country boy. It was an idyllic childhood, he said, but he decided to leave that traditional rural South Africa to go to Johannesburg and study law. He lived in Alexandria and then Soweto, both melting pots of South African society (but without any members of the white population). Mandela became a member of the burgeoning black class of artists, musicians and writers while his work as a lawyer gave him a chance to meet and befriend whites too. Through his legal work be became involved in the African National Congress and became the radical leader of the youth wing. Here he came into contact with Communist Party members, mostly Jewish, who saw the National Party as a South African version of the Nazis. Evidence suggests that he joined the Communist Party though he firmly denied it later. But he did attend their great, non-racial parties and joined in their debates and discussions. Mandela – never one to shun a party – engaged intensely with them and also joined the dynamic music, media and art scene that was emerging in the black community. Hugh Masekela, Miriam Makeba and others became close friends. But he never forgot that the purpose of his life was to end the Apartheid system. As the Cold War got colder, the government used Communism as a pretext for suppressing any demands for human rights or trade union activity. In 1963, after several years of trying to push back against the repressive state by legal, non-violent means, Mandela opted to go abroad for military training organised by the Communist Party – another life-changing choice. When he returned he moved around in disguise but before long was betrayed and captured. The underground resistance to Apartheid achieved almost nothing. All were soon rounded up and Mandela faced trial and the death penalty. He did not bend or beg for mercy, but from the dock defended his choice to use force to overthrow apartheid, which is now recognized as one of the great speeches of the 20th century. Ironically, jail brought him into increased contact with South Africans from other societies. At first he was held with common criminals, many of them violent gang leaders. There were also spies planted among the prisoners who betrayed the secret discussions and plans of ANC prisoners. The prison guards were drawn from the lowest orders of white society. Violent bullying was their culture and they enjoyed provoking black prisoners into lashing out at them so they could punish them. With both, Mandela used his sharp legal brain to make formal complaints which the system had to take seriously. Although they continued to find petty ways of humiliating the prisoners, the guards had to be careful. Gradually the tension subsided and an extraordinary almost mystical transformation took place that changed almost everyone at that prison. All agree Mandela’s personality and vision was the trigger for that transformation. If you visit Robben Island today you are likely to be shown around by a former inmate or guard. They are interchangeable. But this arrangement between prisoners and warders was disrupted in the mid 1970s by the arrival of a new generation which protested against the teaching of Afrikaans in schools. This had led to the Soweto uprising led by school children. Their leaders’ ideology was different to the ANC’s. They saw the whites – all whites – as oppressors and called on all black people to reject white culture and all contact. Apartheid, they believed, could only be challenged by black people standing up for themselves and fighting back at every opportunity. They regarded Mandela and his generation as sell-outs, irrelevant. But they needed his legal skills to defend them when they were punished and gradually many of them began to understand that, although he treated the guards with respect, his political position had not changed. The debate between the non-racial, democratic socialism of the ANC and Black Consciousness prisoners went on for more than three years. On Robben Island in those years the new South Africa was born and was later to create the most humanistic and liberal constitution in the world. Nelson Mandela was its father. He wore his success lightly. 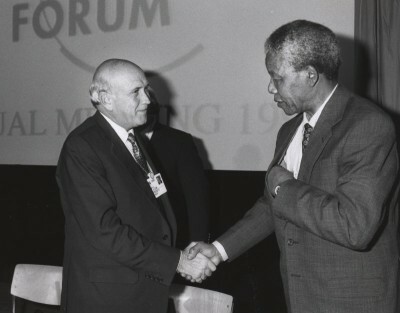 Later as President, he commiserated with his predecessor, F.W de Klerk, at a public dinner. While de Klerk, Mandela said, was bald because he had the terrible job of running South Africa, he still had hair because he had been resting in the sun on an island off South Africa. After his release I was at his first press conference with scores of journalists from all over the world. At the end the entire press corps stood up and applauded him – something I have never seen the press corps do before or since. I then followed him on his triumphal tour of Africa and other countries. But it was not all triumphant. By his own admission he neglected the spread of AIDS in South Africa. It was difficult to start another new campaign just as everyone celebrated with relief the country’s success in not descending into horrific civil war. As a result, hundreds of thousands died before the government took it seriously. He also failed to unite Africa in 1998 when more than six African armies invaded Congo and fought each other. And occasionally I saw another side to Mandela. He would often say he was no saint and there was indeed a messy, sad side to his life – his family. His first marriage ended in divorce leaving two young children bereft. His second marriage to Winnie also ended tragically and the family to this day is divided and squabbling over his legacy. I also once saw an angry, petulant Mandela – he was giving a press conference in a very small room but insisted on having a microphone. When it was pointed out that there wasn’t one and it was unnecessary anyway, he adopted a faraway look and refused to speak at all until one was found. But I never saw him lose his dignity by a snide or cynical comment or gesture. On the contrary, when he met people, whether presidents or peasants, he gave them his entire attention, looking them in the eye rather than beyond them for the photo opportunity or another, more interesting person. He loved celebrities, even minor ones, but then he treated everyone like a celebrity, always willing to be photographed shaking hands with people. Whatever happens from now on in South Africa, Africa, the world, there is no doubt that Nelson Mandela will be an inspiration for those seeking freedom and justice. To me he is the greatest leader of the 20th Century. Thank you Richard for a very informative and interesting account. I learned far more from this than from hours of outpourings and commentaries on BBC and Al Jazeera. One of the most famous individuals in the world, the subject of volumes of careful research, still knew how to keep a secret. A great loss and a great pity that his leadership qualities, vision and humility have not been replicated by his Presidential successors. Falling asleep on Thursday night on the edges of an African capital, barely audible amid the calls of crickets and frogs, I swear that I could hear the collective sigh of relief from various presidents around the continent. With the old man gone and no longer breathing down their necks, they can roll up their sleeves and really get down to their nasty businesses.